Do You Know The Rules of Omaha Hi Lo? This variant of Omaha Poker is a natural introduction to ”high-low split” games. Unlike ordinary Omaha-hand, the pot in Omaha High-Low is dealt in two between a high hand and a low hand. The player MUST use 2 of the four private cards dealt in order to make his playing hand. To qualify for the low hand the player must have 5 cards which is 8 or lower, and no pairs. Straight and Flush is ok, and the general rule is: The lower, the better. Aces can count as low. The best low hand you can have is A-2-3-4-5. This hand is called “The Wheel”. A hand with 8-4-3-2-A is a poorer low hand than /-6-4-3-2, since it is the lowest number value from the top which determine the low hand. The high hand share of the pot is played as normal, and the best poker hand wins. If no low hands qualify, the high hand will take the whole pot! Those who gets the button in front of them is the dealer. The two players to the left of the dealer must put blinds into the pot. The first players bets a “small blind”, and the next one a “big blind”. These two first bets in the pot is called blind since the betting happens before any card is dealt. The Big blind is usually the double of the small blind. Just as in ordinary Omaha each player must construct their best hand with two of their dealt cards and three community cards. The cards does not need to be the same for high and low. The players can use any combination of two cards for each share of the pot, and they can use the same or two cards double up. To qualify for the low hand players must use two of their own cards and three from the table. If it shows up that the table doesn’t have three cards with 8 or lower the low hand will not be an option and tthe full pot will go to the high hand. Each player gets four private cards ”hole cards” or ”pocket cards”. After receiving the cards each player has to figure out if the dealt cards are worth playing or not, and match the actual bet on the table. The players have the option to fold, keep on with the betting and do nothing when it is their turn, ”call”, or raise the bet. Any player who wants to fold must wait until it is their turn. If it has been no raise of the bet when the round is at the big blind again, the big-blind player can raise the bet. Everyone who wish to join has to pay the increased bet. When all bets are done, the game continues to the next phase. The Flop consists of three community cards in the middle of the table. Every player can use these card to make their best poker hand. A new betting round starts. 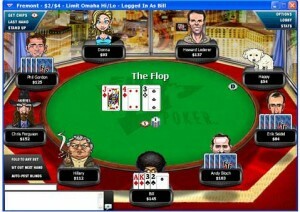 The players have the option to fold, accept the previous players action “call”, raise the bet or check. Check is the situation when no matching bets remains. Anyone who wants to fold must wait until it is their turn. The game will now continue with “The Turn”. The Turn is also known as “fourth street”, and this is the fourth community card. The players must now construct their best five cards poker hand from the 8 cards available. Those who remain in the game after this round continues until the last community cards is revealed. The River is the fifth and last community card. The players must now construct their best five cards poker hand from the 9 cards available. The last betting round takes place as described above. The player who paid the last bet must show his cards first. If the last round was a “check”-round, i.e, no bets, it is the first player to the left for the dealer which have to show his cards first. The player with the best 5 cards poker hand wins the pot. If two players have similar cards, they share the pot. Welcome to the Jetpack Brontosaurus blog! Find useful information in our articles about gaming and gambling. Learn how to become a successful gamer effortlessly! How to Bet NBA basketball?